So, yeah, I am a Libra. We are notoriously indecisive. 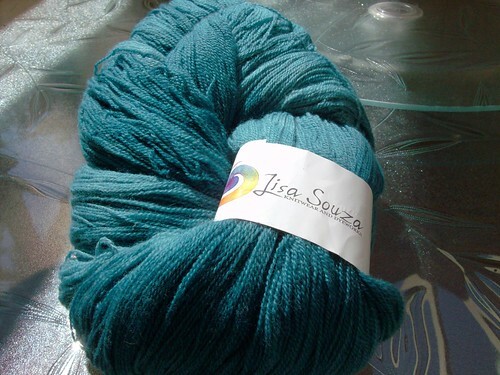 But, I think I have some decisions made in preparation for Mystery Stole 4. I did MS3 last year, and had a blast (not to mention ending up with a gorgeous stole to boot), so when Melanie opened up signups for this year, I was all over it. If you are interested, you’ve got until September 12 to sign up, but the first clue comes out this Friday, 9/5. Ain’t it purty? 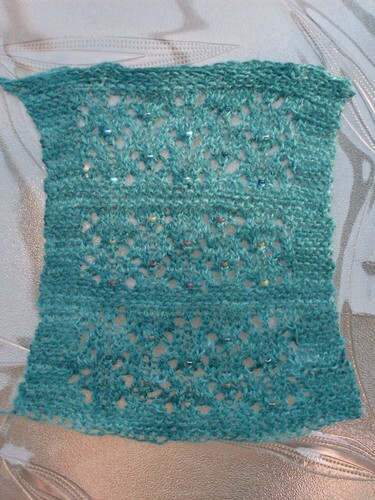 We had 90% decided on one particular mix of beads, but since I was trying to decide needle size anyway, I decided to swatch with all three of the mixes I liked best and see how they worked with the yarn. Left to right,that’s Aqua Mist, Grey Diamonds, and Coffee Latte. Amanda and I were strongly leaning toward the Grey Diamonds mix, because we thought it would make a nice contrast, but I was also curious to see how the Coffee Latte mix looked. I’m REALLY glad I swatched, because I am not thrilled with how the Grey Diamonds looks. They are really hard to see. 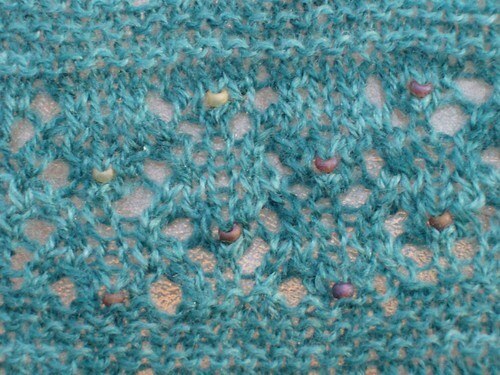 I love the colors in the Coffee Latte, but I think the matte finish of the beads gets lost against the yarn. I am really happy with the way the Aqua Mist looks, though, so I’m going with that. I’m also going with the smallest needle (in the Coffee Latte section of the swatch) – I think that has the best look in the fabric. So, now, I wait for clue #1 on Friday! And now, off to the porch to do some work on the walls. We’re hoping we might be able to tackle the roof this weekend. 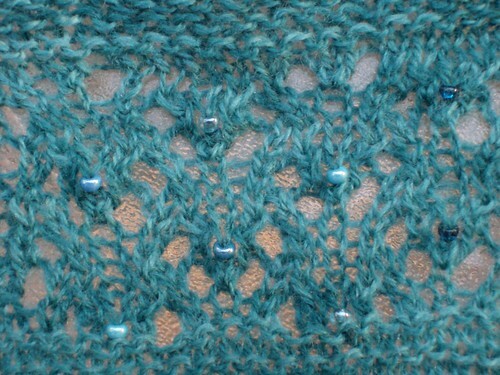 September 3rd, 2008 | Tags: Mystery Stole 4 KAL | Category: Misc. 9 comments to Decisions. I Think. I commented on your Flickr, but you’d apparently already decided! I do like the Grey Diamonds and Aqua Mist almost equally well, but I generally like really subtle beads. Good luck with the porch! Yeah I think the Aqua Mist looks the best. Not too flashy but not too invisible. Count me as another Aqua mist lover. It’s going to be so pretty! I looked at the swatch and the beads and picked out exactly what you picked out before I read that you picked it! 😉 Enjoy. I think it will be beautiful! What Kathleen said…. seriously! Lovely potential, that project. 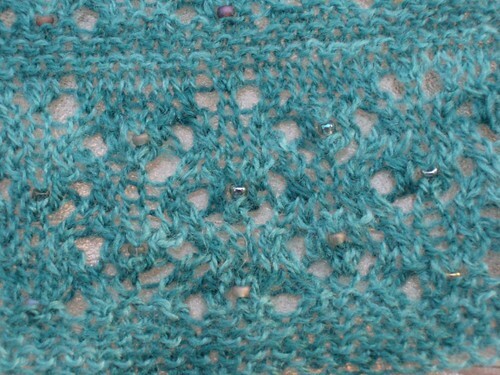 And good job swatching! The colorblind guy agrees wholeheartedly with your choice. 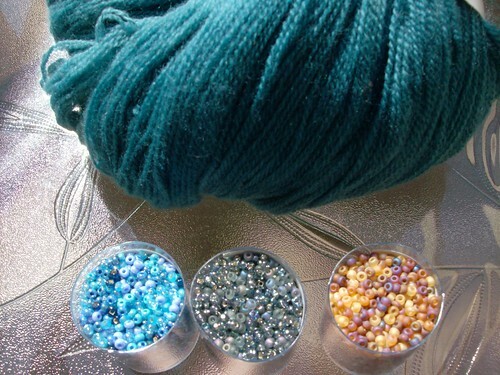 Never would have expected that – I loved those grey beads. But you know, you are SO right! Aqua is the right choice. Thank goodness for swatching! Yep. Aqua mist is puuuuurty. Nice choice!